1. To develop a method for converting tithe data for parishes in North-West Shropshire to a spatial digital database. 2. 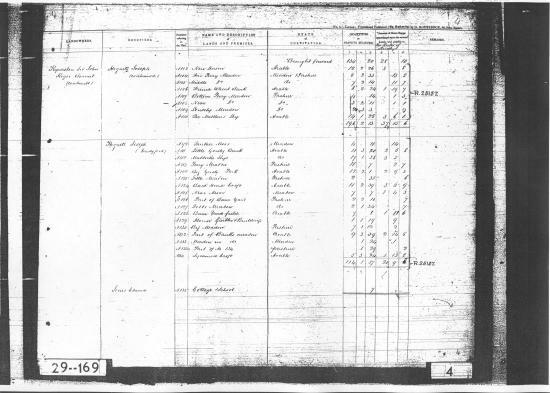 To use the database to create information about social and economic conditions in the area in the mid-19th century. A tithe is a tax on land, levied according to the productivity of the land. The Tithe Maps and Apportionments, dated between 1836 and 1848, record the tithe paid on each piece of land, as part of the implementation of the 1836 Act of Parliament to commute tithes from payment in kind to a money payment. The University of Portsmouth Geography Department has an excellent introduction to the Tithe Survey at http://www.envf.port.ac.uk/geo/tithe.html. The original documents are at the Public Record Office in Kew, London and inaccessible to researchers in New Zealand. However, the documents have been microfilmed and photocopies from the microfilm are available. The Tithe Map for Hordley Parish, as photocopied data, consists of 6 A3 sheets. The maps show land parcel and tithe area boundaries, buildings, roads, watercourses and woodland. The apportionment is a table with columns for the names of landowners and occupiers, the tithe area or land parcel number, the name of the piece of land, its land use, its area in acres, rods and perches, the tithe payable in pounds, shillings and pence, and a column for remarks.